The Deep Blue Sea reviewed: How did I miss this movie? I ignored this movie for far too long. Don’t make the same mistake. 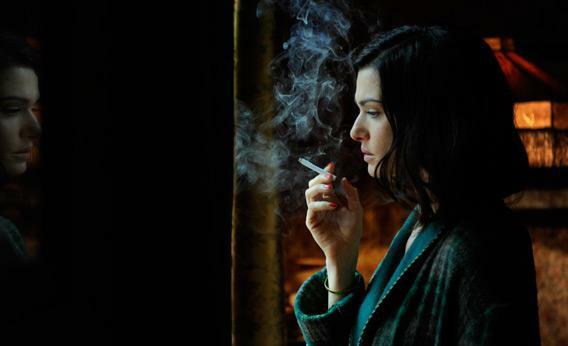 Rachel Weisz as Hester Collyer in The Deep Blue Sea. How did I miss The Deep Blue Sea, Terence Davies’ meditative, dreamlike adaptation of Terence Rattigan’s 1955 play about unrequited love in postwar London, back when it came out last spring? But whatever my reason for blowing off The Deep Blue Sea, it was a mistake. I watched it on Netflix Instant last night, and to my surprise and delight, it may end up numbering among my top 10 of the year. Weisz is astonishing as a character who’s very messy indeed: the passionate, self-destructive Hester Collyer, wife of the much older Sir William Collyer (Simon Russell Beale). The film opens, a legend tells us, “around 1950,” in grimy, down-at-heels post-WWII London (deftly evoked by James Merifield’s production design, which boasts some seriously depressing wallpapers). After the uxorious but milquetoasty Sir William discovers his wife has been having an affair with a younger man, the suave Royal Air Force pilot Freddie Page (Tom Hiddleston), Hester shocks everyone by leaving her husband and moving into a squalid walkup flat, where she lives by herself, (badly) kept by Freddie as an on-again, off-again mistress. That’s Davies’ point, I think, in beginning with that daringly operatic opening montage: The Deep Blue Sea is, in part at least, about the humiliating gulf that often separates our love objects and our estimation of our love objects. This is a woman-who-loved-too-much story in the tradition of Madame Bovary or Visconti’s Senso or Truffaut’s The Story of Adele H.: a study in female masochism that shows how romantic obsession, taken to an extreme, can provide its own sick brand of feminine empowerment. Freddie, it soon turns out, is an inconstant, heartless cad who doesn’t even bother to show up for his mistress’s birthday and coldly rejects her when she seeks him out among friends at the pub. He’s also the world’s cheapest sugar daddy, barely providing Hester with enough to keep the landlady at bay and lamely offering instead that she hock his golf clubs for cash. Yet she clings with fierce pride to the absoluteness of her love for him, even when her husband, witnessing the state that Freddie has reduced her to, makes gestures toward getting her back. Though playwright Rattigan, who was gay, originally intended the drama in part as a commentary on the misery of life in the closet, Davies makes it work equally well as a feminist parable: Given the narrowness of her life choices, jettisoning a respectable marriage for the man who keeps her in sexual thrall may be the closest thing to freedom Hester’s ever experienced. This love-triangle plot may be pure melodrama (a genre classification I use without scorn), but The Deep Blue Sea is one of those films that’s about more than its central story—moving and beautifully acted though that story is. In tiny, economical brushstrokes, Davies communicates a great deal about the fragile social fabric of postwar London. In another musical interlude later on (The Deep Blue Sea is constructed around musical interludes the way an opera is around arias), Hester descends into an empty tube station where she and her husband once took shelter during the London Blitz. Abruptly, the empty station becomes as it was then, full of huddled citizens singing an old song as the tunnel above their heads is pounded by bombs. These unmarked, disorienting shifts between present and past emphasize how close to the surface of daily life the war still was in 1950. So do Freddie’s periodic drunken rages, as he clearly strains to spin his wartime experience as a thrilling, heroic adventure rather than an abiding trauma. “This isn’t Sophocles,” Hester dryly reminds a character who refers to her self-imposed penury and loneliness as “tragic.” No, but The Deep Blue Sea is something almost as hard to pull off on film: a spare, elegant, yet deeply involving adaptation of a mid-century British drama that could easily feel stodgy and dated. Hiddleston—whom we’ve seen onscreen most recently as the supervillain Loki in Thor and The Avengers, and as a gallant British cavalry officer in War Horse—digs into the opportunity to play something more complicated than starchy uprightness or sneering evil. His Freddie is a weak, vain man who’s perfectly aware of his weakness and vanity, and hates himself for it. And Beale is heartbreaking as the cuckolded, resentful, but still hoping-against-hope husband. But it’s Weisz’ Hester, uplifted and transfigured by an affair she freely acknowledges to be sordid and absurd, who keeps this lush, florid fever dream of a movie from feeling histrionic or overwrought. It’s a performance that transforms her from actress to movie star.